Iowa results; Rubio grabs momentum heading to New Hampshire; What analysts want to hear from Marissa Mayer; Oscars add a touch of diversity; Google surpasses Apple as world's most valuable company; Delta apologizes for flight attendant fight. 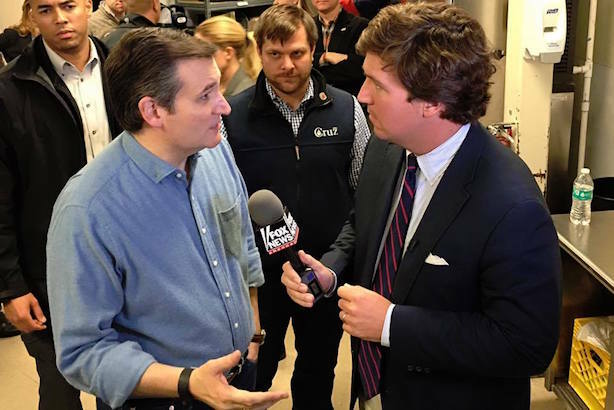 Cruz chatting with Fox News' Tucker Carlson. (Image via Cruz's Facebook page). Ted Cruz upset Donald Trump to win the Republican contest. Depending on the source, Hillary Clinton either squeezed out a win over Bernie Sanders or is locked in a virtual tie with the Vermont senator. Mike Huckabee and Martin O’Malley have suspended their campaigns. Dr. Ben Carson needs a break and is going back to Florida. While Cruz won the Republican caucuses, Marco Rubio claimed the mantle of establishment GOP favorite with momentum going into the race’s first primary election. The camps of Clinton and Sanders are preparing for a long battle ahead. Jeb Bush’s aides are saying their man has a better chance in the Granite State. Washington Post: How Sanders caught fire in Iowa and turned the Clinton coronation into a real race; New York Times: Tight Democratic race in Iowa unnerves Clinton campaign; Gawker: Rubio loses Iowa Caucuses, wins narrative primary; Wall Street Journal: Cruz’s Iowa win powered by evangelicals, conservatives. Analysts will be looking at more than Yahoo’s fourth-quarter numbers on Tuesday afternoon, they’ll want to hear more about CEO Marissa Mayer’s turnaround plans for the company. The investor presentation is bound to create some bad press by touching on thousands of layoffs. Mogul Quincy Jones and actress Kerry Washington will be among the presenters at the Oscars later this month, as the Academy tries to add a splash of diversity. Jones is expected to use the cameo to make a statement about the importance of diversity in the arts. Alphabet, previously known as Google, surpassed Apple for that title in after-hours trading on Monday with a market capitalization of nearly $565 billion. (Apple’s is $539 billion). The Google parent company reported earnings on Monday afternoon that beat investors’ and analysts’ expectations. The airline has said "sorry" to customers for an argument between flight attendants on a January 22 flight from Los Angeles to Minneapolis that forced pilots to land the plane halfway through the trip. Delta said the attendants didn’t live up to the standard it expects from employees.